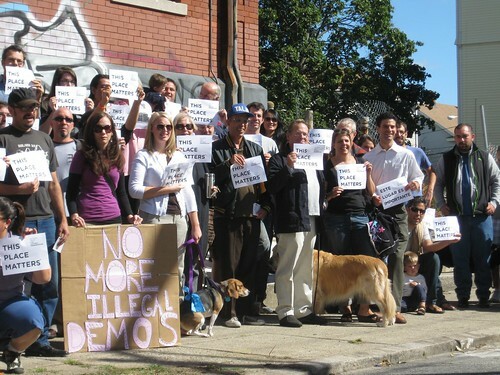 This morning around 50 people rallied for Grove Street School on Federal Hill. Of course we’ve been reporting on this issue for years, but for the uninitiated the story goes like this: The Tarro family illegally demolished a portion of the school in early 2007 and the city has been fighting in the courts (and winning) to get the owners to shore up the building. Michael Tarro is an Assistant City Solicitor and is currently running to replace Steven Costantino in the General Assembly. Mr. Tarro did not show up at today’s rally, but 5 of his supporters were there heckling during the speaking program. 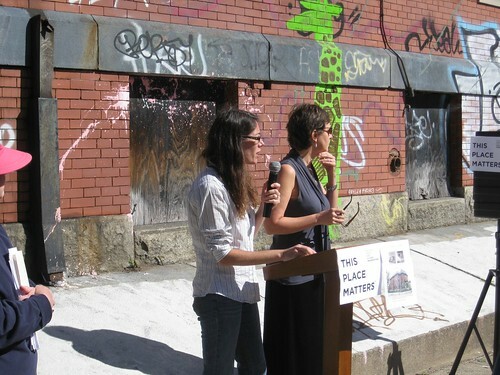 The Tarro supporters claim that the building is a neighborhood nuisance, attracts rats, is unsafe for children who play in it, and should be torn down. While there is no doubt that the building in it’s current condition has become a nuisance, the remedy for that nuisance is not to complete the demolition. I would also like to point out that people have a personal responsibility for the safety of their children. If I had ever been injured while trespassing in an abandoned building as a child, I would have been grounded, my parents would not have demanded the building I was trespassing in be torn down. My parents probably would have made me apologize to the owners for being in their building. 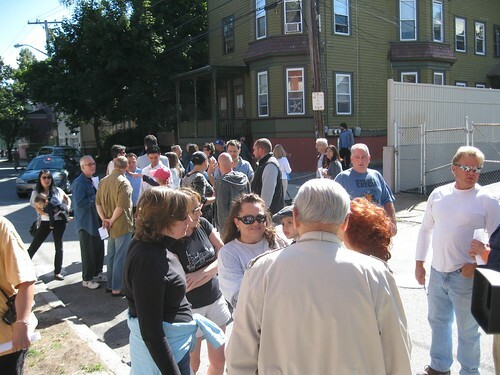 The neighbors supporting demolition claimed that a park would be built on the site “for the children.” The Tarro family has always claimed that they need to tear down the building for parking for their funeral home across the street. A park has never been part of the plan, and it is certain that the city, with it’s financial house in disarray as it is, will not be building a park here. Structural engineer and architect Will Yoder spoke about his assessment of the building and finds that the remaining portions (which is the vast majority of the structure) are structurally sound and that the building could be converted to housing or other uses. After the rally, those of us with smart phones used them to report the buidling to the city via SeeClickFix. Greater City: Providence does not make endorsements, but we do give you information you can use to make up your own mind. 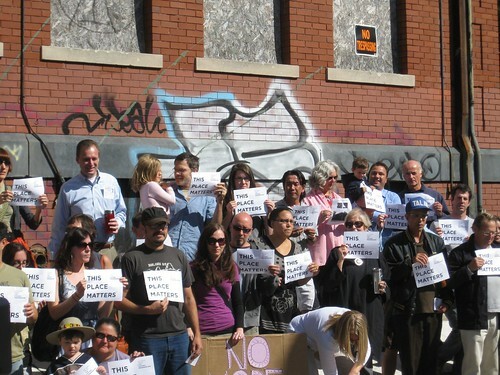 Several candidates were at the rally this morning, as noted above, Michael Tarro was not. One of his opponents in the District 8 State Rep. race, Anthony Scarcella was. Mr. Scarcella was there in support for renovating and reusing the school. So, if you live in District 8, there’s the information we’re providing to you to help you make your voting decisions. A little bit more history–when the building was decomissioned, like many old school houses across the city, the option to buy it was put out to neighbors and potential developers. The building was bought for cheap, but there as a stipulation, the owners had a certain amount of time to complete the redevelopment (or whatever they were going to do.) That date came and went in the 90s. The City missed the opportunity then to have the property revert back to the city, which was the standard cause of action in these cases. So while the the purchase of the building, and the payment of taxes on said building appears to have been done “by the book,” nothing since then has been. It was supposed to be developed by a certain time frame, it wasn’t. It was supposed to be kept up, it wasn’t. It was supposed to NOT BE TORN DOWN ON A SATURDAY, it was. And now it was supposed to be secured so it would not be a neighborhood hazard for the last four years and of course, it has not been. It boggles the mind that someone who works for the city enforcing these very laws has been allowed to break them so egregiously, and then have the brass to run for office, representing this very community! It is like a bad joke. I have always defended Providence and its crazy politics, but this is beyond the pale, whether you agree with historic preservation and this school’s issue or not. I’m honestly surprised the rally attendees were not arrested for trespassing. I’m sorry I couldn’t make it today. I depend on the email notifications from facebook as I don’t stay logged into the site all day. Mine arrived 30 minutes after the event had begun. That being said, why doesn’t the city just take the property by eminent domain? That would make a lot of sense. I also wonder if this is one of Mr. Tarro’s four properties that he owes taxes on. City should take the building by eminent domain. Absolutely. 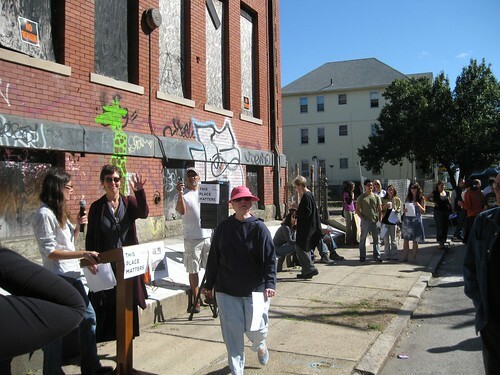 I love how the commenters to the ProJo article the other day blamed WBNA for keeping the building from being torn down and causing harm to the neighborhood. What convoluted logic! Blame, if you like, a) the crooks that illegally demolished the building, *knowing full well* that the city would just slap them a little fine and demolition would just go on as planned, as has always the norm in this crooked city. b) blame the city for not enforcing laws in past when the building was to be restored and reused, c) the city for not enforcing the laws NOW — that partially demolished and unsecured building should have racked up so many fines by now that the city would own the building outright. When this first happened, I heard rumors that the owners were going to have to pay a detail or security co to stand watch over the building, keeping it secure for the neighborhood. THAT is what should have happened. Both the owners and the city are to blame. But instead you choose to blame your neighborhood advocates??! 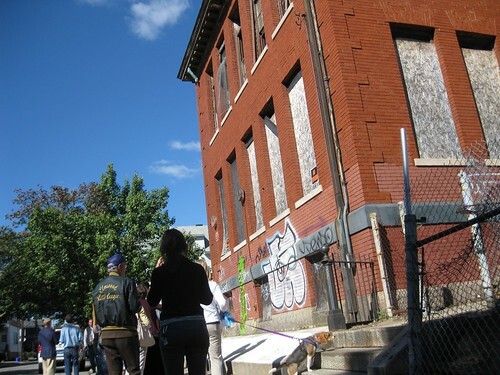 There has been a lot of controversy in the neighborhood centering around the historic Grove St. School; from the initial illegal attempts at demolition to its being left to languish unprotected from the elements and an eyesore to the community. I firmly believe in the sacrosanct nature of private property, however, when that property is part of the historic fabric of our city, we, as proprietors, have a responsibility to history to preserve what has been handed down to us. A responsibility to respect those who have gone before us, in this case the Grove St. School where thousands of children for over a century were educated; sought to better their lives and brought honor to their families and community by becoming leaders and eminent exponents of their profession. This building is a monument to what Providence and Rhode Island are about. We have a duty to future generations to show where they came from and give them a base to construct their future. If we tear down these edifices what will we leave as a heritage? empty spaces or unsightly buildings? We are indeed fortunate here in Providence to have a great architectural patrimony; but of this patrimony we are merely custodians, holding on to it, preserving it for future generations. We have lost many unique and priceless buildings due to greed and/or lack of appreciation of the rarity they possessed. Let us not add the Grove St School to the list; it is majestic but simple; historic but timely. It stands for us, the people of Federal Hill, the people of Providence. Before I close, I would like to pass on one further comment. In our lives there are two significant dates, the date of birth and the date we pass on to a better life. They are usually connected by a dash, the most simple of the signs and symbols that facilitate our means of communication. But, this most simple of symbols is the most important because it connects those two dates; in that brief dash there is the summation of our lives, all we did, all we didn’t do and all we could have done but didn’t. It is our life. On Tuesday, November 2, let us put meaning into that dash and exercise our right and DUTY to vote. If we cannot find a few minutes to reflect on our choices and express them by voting then we are truly sorry examples of a privileged citizenship. Let us not forget that we all have rights but those rights are not in and themselves independent. They stand on our obligations to perform our duty as citizens. Please, on Tuesday, reflect before you vote then vote. I wrote a letter to the editor about this, but it doesn’t look like it was printed, but basically I called on the mayor to secure the building, put a lien on it for the cost and to get Tarro off the city’s payroll. 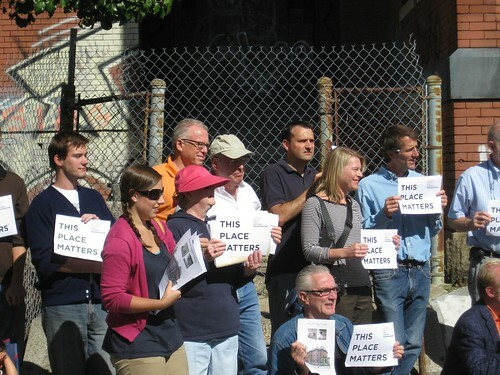 Greater City: Providence would probably print your letter if the ProJo won’t.